Northeast corner of 2nd Avenue and Walnut Street in Des Moines. 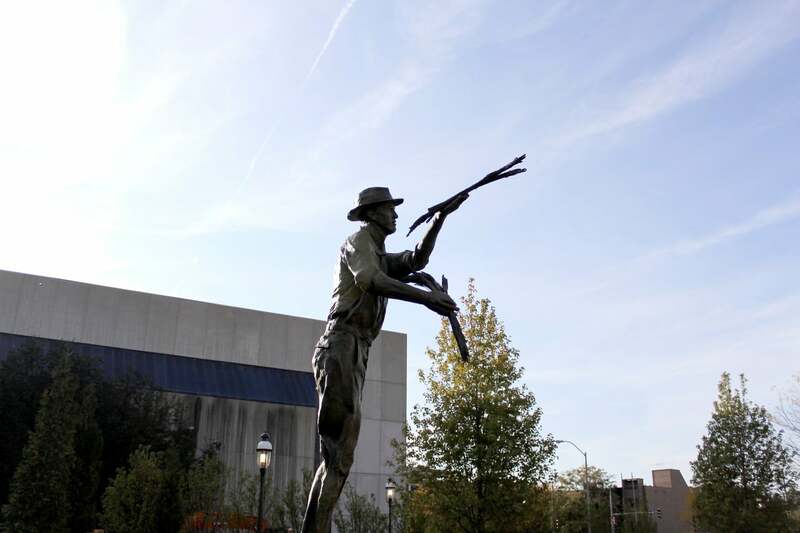 John Collier created this eight-foot statue of Dr. Norman E. Borlaug (1914 – 2009), the agronomist, humanitarian, father of the Green Revolution and founder of The World Food Prize. The artist depicts the scientist in his work clothes. 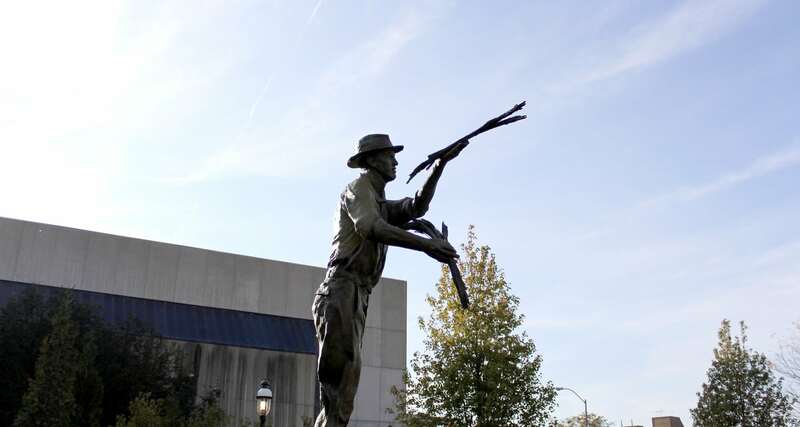 The figure of Dr. Borlaug stands in the public gardens of the Borlaug Hall of Laureates and faces northwest towards his grandparents’ farm near the town of Cresco, in Howard County, Iowa, where he was born. In 1970 Norman E. Borlaug was awarded the Nobel Peace Prize for a lifetime of work to feed a hungry world. Although a scientist with outstanding contributions, perhaps Dr. Borlaug’s greatest achievement was his unending struggle to integrate the various streams of agricultural research into viable technologies and to persuade political leaders to bring these advances to fruition. Dr. Borlaug received his Ph.D. in plant pathology and genetics from the University of Minnesota in 1942. He led the introduction of high-yielding wheat varieties and production techniques in Mexico, Pakistan, and India. He developed disease-resistant varieties of wheat that produced much more grain than traditional strains. “Norman E. Borlaug saved more lives than any man in human history,” said Josette Sheeran, executive director of the U.N. World Food Program. “His heart was as big as his brilliant mind, but it was his passion and compassion that moved the world.” He remained active well into his 90s, campaigning for the use of biotechnology to fight hunger.